Psycho puppy, qu'est-ce que c'est ? Someday there will be fiber work again on this blog. I'm working on a Keesmere scarf/hat set for an auction to pay the medical bills of Keeshonden rescued by the folks who pulled Buki. The scarf is pretty long now, although evil puppy who shall not be named disemboweled the ball of yarn the other day. Fortunately, the yarn didn't break or tangle severely, but knitting slows down considerably when you're on the defensive! Fourteen deer decided to have a meeting in my yard yesterday afternoon. This is not uncommon during hunting season. The deer seem to know that they won't be hunted near the house. Huey protests his absence from the blog by morphing into Basement Cat. Buki is a year old today. This is what I call his "fresh doggy face" (as opposed to "sad doggy face"). He really, really wanted to grab the camera strap! We will celebrate with the traditional scrambled egg on his dinner, and he already got a bunch of new toys on Monday. He also got to sniff noses with a very large dog while we were out walking. Today is Jeeves' fourth birthday. He's been happily toasting himself in sunshine all day. 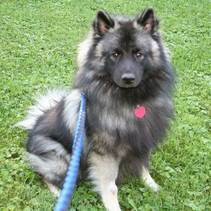 Meet Sambuca, now known as Bookey (as in Shellicky Bookey), a huge nine month old Keeshond. I picked him up yesterday, and he's settling in very well, especially for a dog who has had no training aside from housebreaking. Comer got very sick a week ago Thursday - so sick, in fact, that I thought I was going to lose her. So I've spent a lot of time to'ing and fro'ing between home and the barn to hand-feed and hand-walk her. Fortunately, she is back to normal now, leaving only a large vet bill behind and not the equally large haul-away-dead-horse bill. And this has to be the best sheep picture I've seen in a while. Cookie lost her long battle with primary hyperparathyroidism today at the age of 13 years and four months.